One of my most popular oils now used to create a hand-poured and dressed candle! Van van is derived from the french-Louisiana pronunciation of vervain as "vaah vahn". It is traditionally created from five plants; citronella, vervain, lemongrass, galangal or ginger root and patchouli. Though recipes vary slightly from worker to worker. All van van should contain lemongrass, some contain ginger or gingergrass. Essential oils of lemongrass and palmarosa are used in the wax. 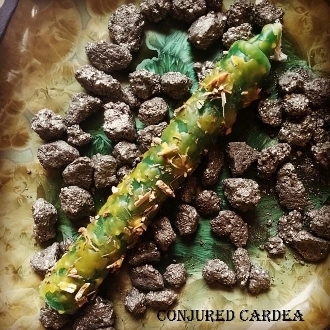 These candles help to reverse bad luck, open doors, create opportunity, protect and calls good fortune near! Each candle is prepared by me at the time of order...no mass produced supplies here. Demand quality in your work. ***HERBS ARE FLAMMABLE AND WILL IGNITE THE CANDLE. This is normal and is how loaded candles burn. This candle is not to be left unattended and should be placed on a large heat-safe vessel to allow for pooling wax and flaming herbs. You may want to add sand or small gravel to disperse the heat.